Question: I have a few questions about quilt-making. I’d like to make a quilt out of my baby’s old clothes as she outgrows them. One question I had was about the size of the quilt. Is it really necessary to know the exact size I want from the start or can I make it and keep making additions to the same quilt for a year or so? Secondly, a lot of the baby’s clothes are that stretch-cotton you know t-shirt material. I don’t think that will hold up well without some sort of backing. Any tips on helping it maintain it’s structure or should I only use the usual cotton materials? 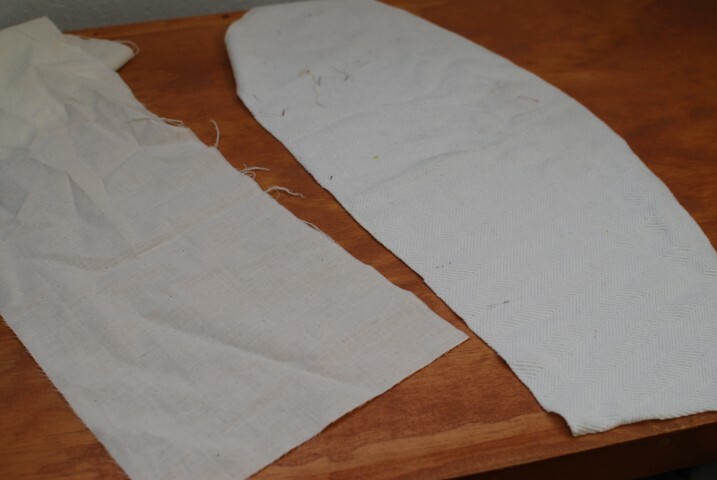 If I need something to put on the back for support what is the most basic way to go about this – I’m abroad mind you so crafting supplies are hard to come by. In old days, they used all scraps. I read a story once about even the slaves collecting whatever scraps they could find new or used, to make a quilt, and then when they could find some extra cotton somewhere, which they picked all the time in early American history, they would use it for the batting ect. start off. There are no rules to quilting. Start piecing together what you have and you can make it as big as you like. I’m actually doing this with a lady’s children’s clothes. She brought me a selection about a year ago and I put them together, but didn’t finish the quilt. A couple months ago, she brought the top back and more blocks and pieces of various clothes to add to the top. 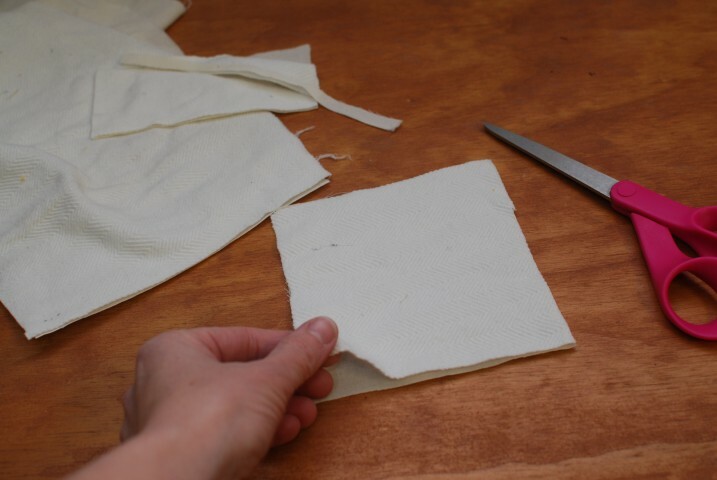 About the stretch cotton or t-shirt material, the way used most often by quilters, is to back it with a light interfacing which has an iron on glue on one side. You put it on the back of the t-shirt block, and then iron it from the back so if the t-shirt block has raised sort of lettering, that your iron won’t stick to them. piece on the back. 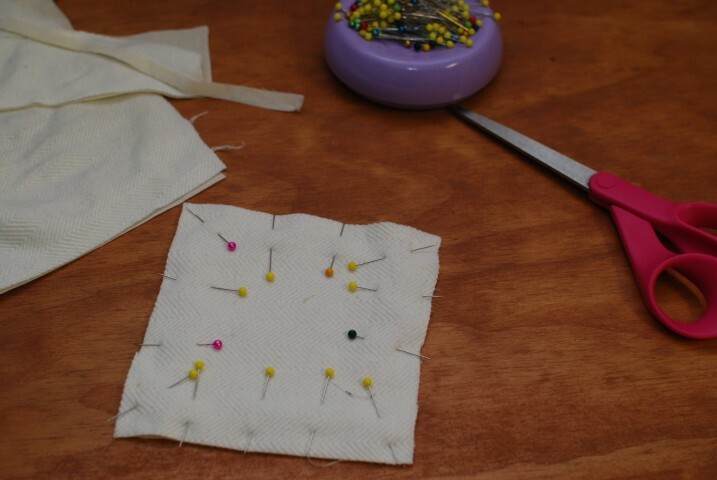 Pin very close together all the way around, and then carefully sew on the very edge right over the pins. Be careful when you go over the pins, as the needle could hit the pin. Then your block is ready to be put into the quilt, together with the other blocks. blocks from a sweater he wanted included in the quilt, so I backed them with a piece of muslin. It kept the piece from stretching, and since the sweater was a wide open weave, it closed it up so later the batting wouldn’t come through. Just piece together what you have and have fun doing it. You can even use an old fleece robe for the batting of your quilt. Enjoy the journey!! I am about to finish the first quilt in your videos. I am LOVING quilting and appreciate your detailed step-by-step instructions. My little boy passed away a few months ago, and I would like to turn some of his baby and toddler clothes into either one quilt, or multiple little quits that his grandparents and aunts can frame. 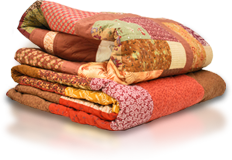 Any tips on finding a pattern that will allow for small pieces of many different fabrics for a big quilt? Or a nice pattern for individual little quilt pieces that I can frame? I just started quilting after Max passed away, and it’s been a comforting activity and something to keep me busy. Thanks so much Martha! 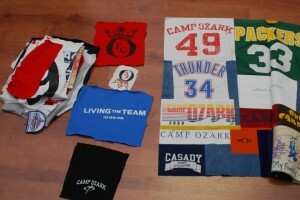 My mom made me an awesome t-shirt quilt as a high school graduation gift. It used all the shirts from plays I’d done from kindergarten through my senior year. I adore it and used it all through college as my comforter! It’s a great way to use up shirts you may never wear again but can’t bear to part with.